By the early twentieth century, what we know as the modern periodic table had largely taken shape. For the most part, what chemical discoveries remained would require the use of nuclear reactors rather than the traditional chemist’s patient examination and chemical analysis of unusual ores. There were, however, a few holes remained in the table, including the spot reserved for element 43, which by this time had acquired a long and troubled history. As early as 1828, various investigators claimed to have isolated a new element which would fill this hole, but for the next century, every scientist who put forth this claim was eventually proven false. Eventually theoretical work provided an explanation for these many failures, establishing that element 43 would be unstable, and therefore impossible to isolate in appreciable quantities from natural sources. This led to attempts to produce element 43 in a laboratory, including those of the Italian chemists Carlo Perrier and Emilo Segre, which proved successful in December 1936. Thus the new element technetium became the first element to be artificially produced, and to this day remains the only element to ever be discovered in Italy. Though technetium is known to exhibit some useful chemical properties, including the ability to protect steel from corrosion in aqueous solutions, its radioactivity precludes most avenues for exploiting these properties. The primary applications for the element are related to its radioactivity. The short-lived gamma-emitter technectium-99m (a medical isomer of technetium-99) is useful medically, as it can be bound to a number of compounds used by the body. It is routinely used in medical imaging of a variety of organ systems. Technetium-99, on the other hand, decays slowly by emitting only beta particles, and is in fact used as a standard beta emitter for equipment calibration. This same isotope also has potential for use in specialized applications such as nuclear batteries. Tc-99 is routinely produced as a component of radioactive waste from nuclear power plants, from which it can be isolated. Tc-99m has a very short half-life, and must be produced from the radioactive decay of molybdenum-99, which itself is produced by irradiating uranium in dedicated reactors. Technetium is a Block D, Group 7, Period 5 element. The number of electrons in each of Technetium's shells is 2, 8, 18, 13, 2 and its electron configuration is [Kr] 4d5 5s2. The technetium atom has a radius of 135.2.pm and its Van der Waals radius is 200.pm. In its elemental form, CAS 7440-26-8, technetium has shiny gray appearance. Technetium is produced as a byproduct of the nuclear industry from spent nuclear fuel rods and was the first element to be made artificially. This is indicated by its name which originates from the Greek word "technetos" meaning artificial. Nearly all technetium is synthetically produced; however, it is found in nature in minute amounts as a result of naturally occurring spontaneous fission or neutron capture by molybdenum. Technetium was discovered by Carlo Perrier and Emilio Segre in 1937. 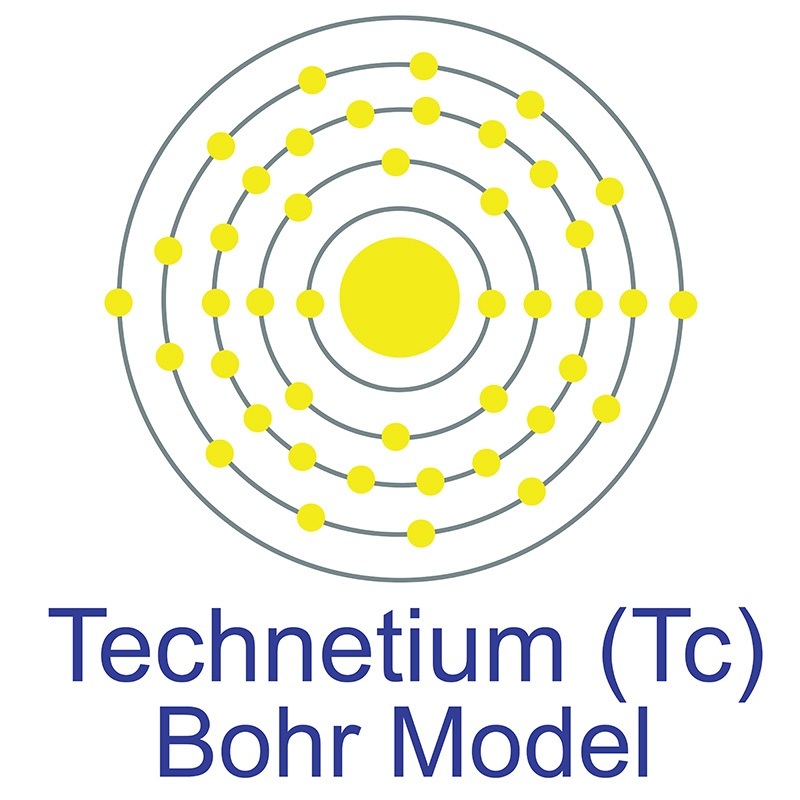 Technetium is used in nuclear medicine for a wide variety of diagnostic tests. Technetium information, including technical data, properties, and other useful facts are specified below. Scientific facts such as the atomic structure, ionization energy, abundance on Earth, conductivity, and thermal properties are included. Technetium has no stable isotopes (all are radioactive).